Today we take a look at the two beautiful Somerset County Covered Bridges, the Barronvale and King's Covered Bridges in Somerset County, with a little bit of fall color starting to appear. This is the longest bridge in Somerset County at roughly 162 feet, with a 13 foot and ten inch width. This bridge is beautiful and it consists of two Burr Truss spans. As far as the date of construction, it seems that there is a huge variation in posted dates. The date posted upon the bridge is 1830, which seems possible, but doubtful considering how early that was in the regional construction of covered bridges. The only date that seems to be agreed upon is that it was reconstructed in 1902. The state survey and Bridgehunter list the date of construction as 1846, whereas VisitPA lists the date as 1845. 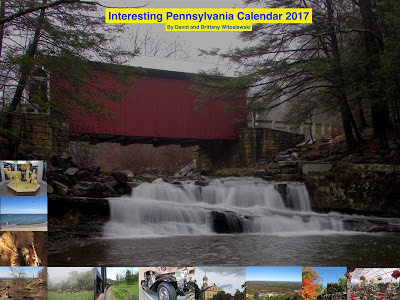 PA Covered Bridges lists the construction date as 1902. Regardless of the date of construction, it is a beautiful bridge and a rare example of a double span Burr Truss bridge. Just down the road from the Barronvale Covered Bridge is King's Covered Bridge. This is another beautiful span that even has a nice pull off and picnic area for sightseers to take in the bridge and the peaceful setting of Laurel Hill Creek. The date of construction for this bridge is also widely disputed, with the marked date being 1806, with a previous marker at the bridge dating 1802. This is pretty unlikely, considering the first confirmed American covered bridge was made in 1805 across the Schuylkill River in Philadelphia. PA Covered Bridges has the date listed as 1906, which is a confirmed date of construction for what was either the construction of the bridge, or a reconstruction. It utilizes multiple Kingpost construction. Regardless of the date of construction, King's Covered Bridge is beautiful. It was fully redone in 2009 after being in pretty poor shape. Now it is a great gathering place for the community. These sorts of efforts are laudable and very important, especially considering how the number of covered bridges in the state has dramatically decreased over the last few decades. It is only a 15 minute drive to this bridge from Ligonier and the Seven Springs and Hidden Valley Ski Resort areas, but its location feels extremely remote. The bridge crosses over Laurel Hill Creek, the namesake for nearby Laurel Hill State Park. It is also only about a six minute drive away from Cole Run Falls, one of the most beautiful sets of falls in Western PA. We highly recommend having a meal or staying the night at the nearby Trenthouse Inn.